A great bag for when you aren’t sure where your adventures will take you. This is a versatile bag that can grow to meet your storage needs and is lightweight and functional enough to be a robust solution for lightweight gear and bulky, lighter weight accessories and clothing. It is also a significant value as a bug out bag accoutrement, that allows you an extra level of preparation through the increased storage space and the quick, lightweight design features. This is not a bag made for super heavy-duty use, but it is very good for working out, carrying sports equipment, or for use as a hunting apparel bag to keep items separated from other tools and luggage. A simple design that incorporates the bag’s “stuff sack” inside the bag itself means you will get a multi-purpose design out of a bag that competes favorably with other weekend type bags or general-purpose utility bags on price and on durability. If you like the duffle bag style, this is a bargain bag that can carry lightweight bulky items with ease. Perfect for tactical gear that is soft sided (like ballistic vest; kneepads, pants, etc.). Q: Your picture for the Blackhawk Stash Pack shows a duffle bag. When I go to BLackhawk's website their picture indicates a backpack. Which is it? Also, you don't list any of the materials out of which it is constructed. What weight fabrics go into this? 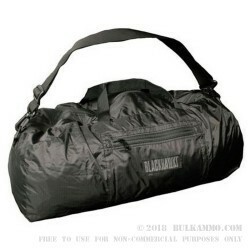 A: This Stash Pack/ Duffle Bag will be identical to that of 20DS00BK on the BLACKHAWK! web site. The image on their site of this item appears to match ours. This will be composed of 210 Denier Nylon material. Please let us know if you have any additional questions about this pack and we will be happy to assist!